I explore the ambivalent connection of Islam and music Western music, from Beethoven to bebop jazz to Michael Jackson, in an occasional series of writings. "You Need Beethoven to Modernize." Middle East Quarterly, September 1998. My major study: It compares Japan and Turkey and argues that attitudes toward the West, as symbolized by classical music, go far to explain success in the modern world. "'Iraqi Symphony Performs for Bush'." DanielPipes.org, December 9, 2003. Follows the artificial career of a U.S.-sponsored institution. "Did Michael Jackson Convert to Islam?" DanielPipes.org, December 18, 2003. Follows the discussion about Jackson's alleged conversion. Also takes up related topics, such as whether Jackson sung the nasheed "Gives Thanks to Allah." "The Erratic Career of Western Music in Iran." DanielPipes.org, December 19, 2005. Looks at a specific instance of anti-Western music fervor. "King of Pop Michael Jackson and Black Converts to Islam." The New York Sun, March 7, 2006. Places Jackson in the perspective of other blacks under stress who, since the 1940s, turned to Islam or to the Nation of Islam for solace and support. "Music and Muslims." DanielPipes.org, August 3, 2007. A catch-all blog that notes interesting developments in the intersection of these two topics. "'Allahu Akbar' = 'Peace Will Prevail'?" DanielPipes.org, September 3, 2008. Report on a self-parodying Jewish-Muslim peace event in Jerusalem. "Islamists Respond to Michael Jackson's Death." DanielPipes.org, June 27, 2009. How their hostility to the pop star ended. "Islam and American Jazz." National Review Online, December 27, 2013. Reviews the surprisingly strong connection between Ahmadiyya Islam and the bebop movement of the 1950s. "I Attended a Royal Oman Symphony Orchestra Concert," National Review Online, Mar. 10, 2017. Recounts attending a performance of "Viennese Classics" in Muscat. 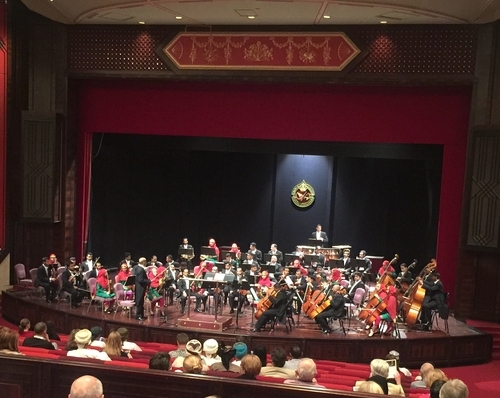 The Royal Oman Symphony Orchestra playing in Muscat. "Allahu Akbar" Means What, Exactly?